Upside Down Podcast - Episode 50 - Begin Again: Examining Our Stories & Introducing New Co-Hosts! What happens when your plans get turned upside down? What happens when you have to begin again? This two-part episode starts on a personal note and ends with exciting introductions of TWO new co-hosts! 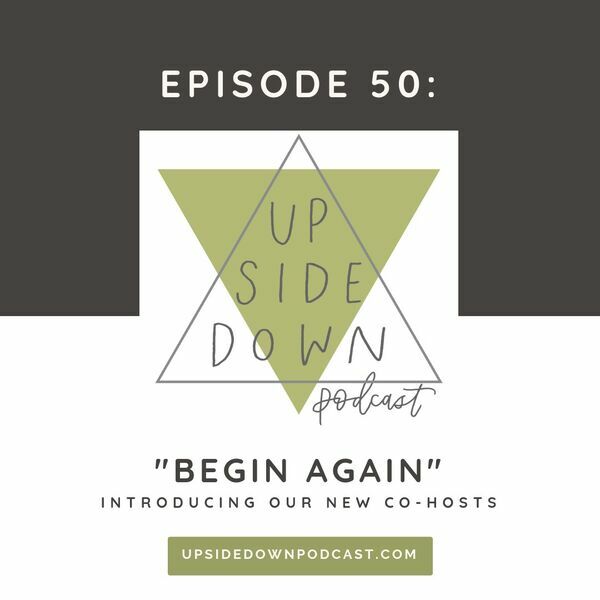 First, Upside Down Podcast founders Kayla and Lindsy share the unexpected events that happened between Jan. 6 and Feb. 6 in both of their families, sharing with vulnerability and heart as they process their grief along with their hopes, reflecting on endings and beginnings. Then, they look ahead to the future of Upside Down Podcast, introducing new co-hosts for the coming season, Alissa Molina and Gina Ciliberto! Upside Down Podcast is an ecumenical podcast, bridging the divide between Catholic and Protestant thought, and we're grateful to welcome our Catholic sisters Alissa and Gina to the digital table! Meet Gina: Gina spends a lot of time with nuns as the mission promoter for the Dominican Sisters of Hope. When she's not learning about the sisters' radical take on God, she's writing about food, travel, and justice on a freelance basis. Meet Alissa: Alissa loves being a wife and mom. Her family of seven lives just outside of Austin, Texas where in between packing lunches and finding matching socks, she thinks a lot about how to become a saint by loving well. News, Notes, and Links: With new hosts, came new mics, and new bills! We're producing this podcast with the help of our community. Would you join us? Please visit upsidedownpodcast.com/give, where you can pledge a few dollars of monthly support to help us pay our bills and keep the conversations going. We couldn't do this without you! Visit Upside Down Podcast for more episodes, to learn more about us, see behind-the-scenes details. Be part of our listener community: Join the Upside Down Tribe on Facebook. We hang out on Instagram. Find us there!